● Hon’ble Chief Minister of Maharashtra Shri Devendra Fadnavis was the Chief Guest at the closing ceremony. 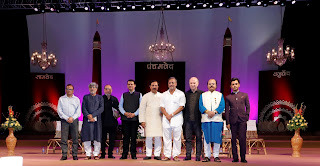 ● Hon’ble Minister of State (I/C), Ministry of Culture, Dr. Mahesh Sharma and eminent theatre and film personality Shri Nana Patekar were Guests of Honour. 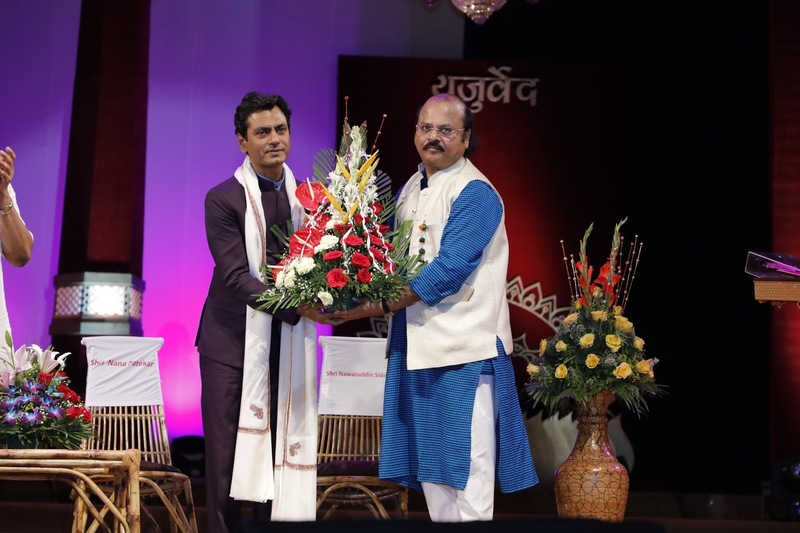 ● The ceremony was honoured by the gracious presence of Artistic Director, 8th Theatre Olympics, Shri Ratan Thiyam and presided over by Acting Chairman, National School of Drama Society, Dr. Arjun Deo Charan. 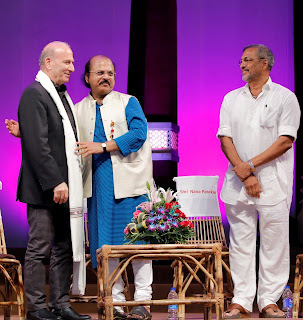 ● Shri Theodoros Terzopoulos, Chairman of the International Committee of Theatre Olympics, Joint Secretary, Ministry of Culture, Shri M L Srivastava, and popular theatre and film personality Shri Nawazuddin Siddiqui were special guests at the closing ceremony. Director of National School of Drama, Prof. Waman Kendre, was also present on the occasion. ● ‘Rang Shikhar’, a collage of tribal, folk and theatre performances, followed the closing ceremony. Mumbai, 8th April 2018: After a glorious run of 51 days across 17 cities of India, the historic event 8th Theatre Olympics drew to a colourful close here today. Hon’ble Chief Minister of Maharashtra Shri Devendra Fadnavis was the Chief Guest at the closing ceremony. Hon’ble Minister of State (I/C), Ministry of Culture, Dr. Mahesh Sharma and eminent theatre and film personality Shri Nana Patekar were Guests of Honour at the closing ceremony. The closing ceremony was honoured by the gracious presence of Artistic Director, 8th Theatre Olympics, Shri Ratan Thiyam and presided over by Acting Chairman, National School of Drama Society, Dr. Arjun Deo Charan. Shri Theodoros Terzopoulos, Chairman of the International Committee of Theatre Olympics, Joint Secretary, Ministry of Culture, Shri M L Srivastava, and popular theatre and film personality Shri Nawazuddin Siddiqui were special guests at the closing ceremony. Director of National School of Drama, Prof. Waman Kendre, was also present on the occasion. “We get many chances to show our strength and potentials, but 8th Theatre Olympics has given us unprecedented opportunity to show the power of our culture. 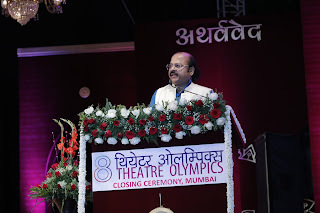 8th Theatre Olympics could not have been possible without the inspirational support of Dr. Mahesh Sharma, our beloved and visionary Culture Minister, Government of India. 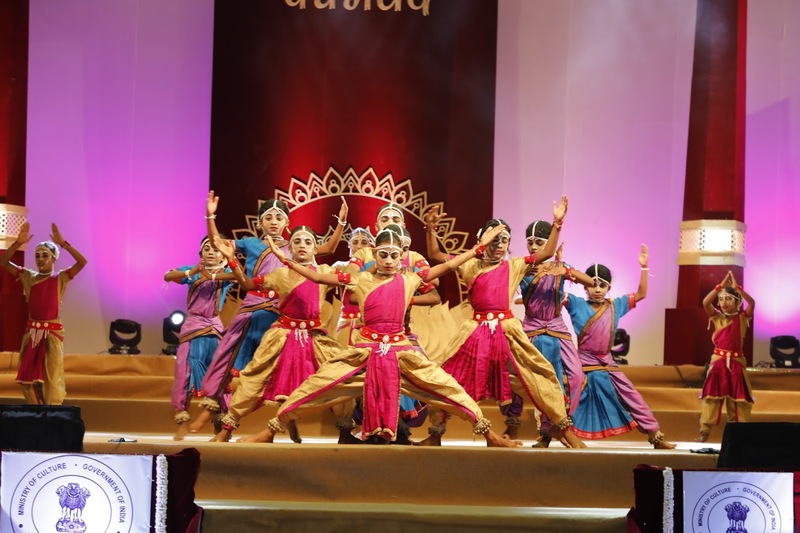 NSD is proud to have organised an event that has shown the cultural might of India, a vision shown by our honourable Prime Minister Narendra Modi,” says Director, National School of Drama Prof. Waman Kendre. “I wish the Indian theatre with support of Indian government should dominate the world. The 9th Theatre Olympics will be jointly organised by Russia and Japan,” says Chairman of the International Committee of Theatre Olympics, Shri Theodoros Terzopoulos. “I am really happy that Prof. Waman Kendre has taken theatre on another platform. 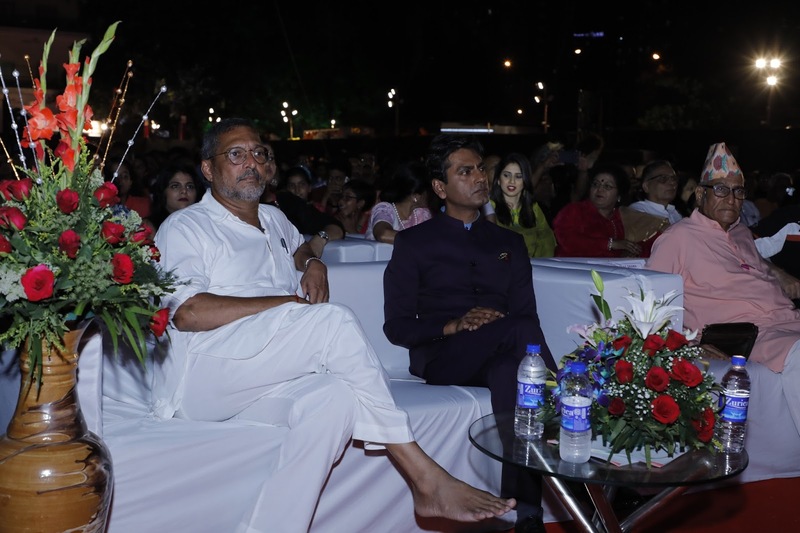 I appreciate your work and thanks that you kept theatre alive, thanks for being associated with theatre for so long in all possible manner,” says eminent theatre and film personality Shri Nana Patekar. “Our rich heritage and culture is the reason that India stands united today despite the diversity. My friends, Life is like Theatre. Like life, it goes on; it is only time, settings and people that change. It is true for this city Mumbai, which goes on in all situations. Entire nation should be woven in the cultural fabric to create a united India. 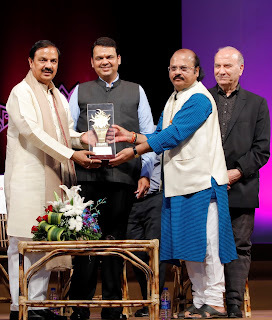 Through Theatre Olympics, we have commenced our journey to reach that goal,” says Hon’ble Minister of State (I/C), Ministry of Culture, Dr. Mahesh Sharma. 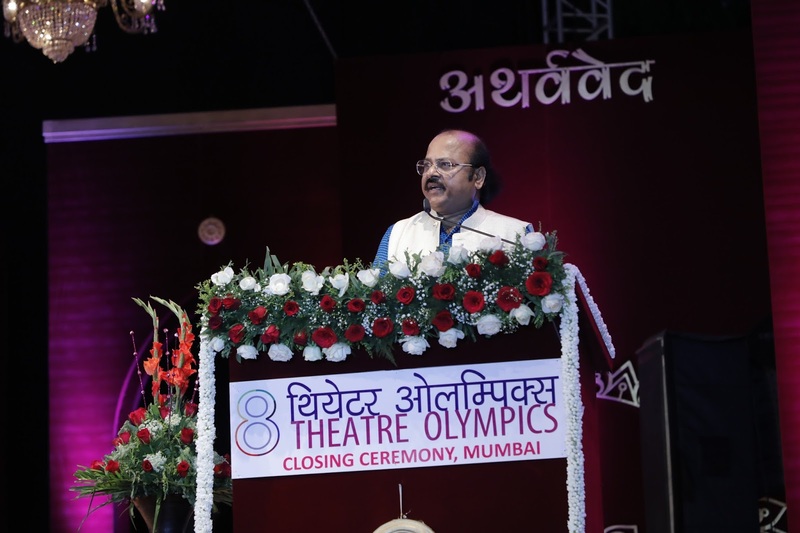 “I thank Dr Mahesh Sharma and NSD to have selected Mumbai to organise the final phase of Theatre Olympics. Maharashtra is known as birthplace of cinema but actually much before that Maharashtra has been the centre for theatrical activities. Our theatre will flourish from generation to generation. Without even the technical aspects of movies, theatre is able to create the effect through acting, and hence our theatre will never die,” says Hon’ble Chief Minister of Maharashtra Shri Devendra Fadnavis. “Theatre is a place where we can reflect all emotions and sentiments of society. Politics also has a bit of theatre in this. If we do our role well, people give us support and when we fail to play our role, they reject us. This I see a parallel between the theatre and politics,” Hon’ble Chief Minister Shri Devendra Fadnavis adds. “We thank Dr. Mahesh Sharma; he took this initiative and took Theatre Olympics on another level. I am grateful to the students and faculty of NSD who have supported all through the event. Also, I thank all the coordinators in the 17 cities who have worked very hard to make this a success,” says Acting Chairman, National School of Drama Society, Dr. Arjun Deo Charan. ‘Rang Shikhar’, a vibrant collage of tribal, folk and theatre performances, followed the closing ceremony. Renowned actors Shri Nawazuddin Siddiqui, Shri Manoj Joshi, Ms. Himani Shivpuri, Shri Sachin Khedekar, along with well-known ventriloquist and puppeteer Shri Ramdas Padhye, famous Bharatnatyam dancer Ms. Sandhya Purecha and famed Lavani dancer Ms. Vaishali Jadhav, performed at the presentation. The 8th Theatre Olympics was inaugurated by Hon’ble Vice President of India, Shri Venkaiah Naidu on 17th February 2018 at the majestic Red Fort in New Delhi. This edition of Theatre Olympics brought together around 25,000 artists under the theme “Flag of Friendship”. The event witnessed 450 shows from more than 30 countries performed across 17 cities such as Agartala, Ahmedabad, Bengaluru, Bhopal, Bhubaneswar, Chandigarh, Chennai, Guwahati, Imphal, Jaipur, Jammu, Kolkata, Mumbai, New Delhi, Patna, Thiruvananthapuram, and Varanasi during the festival. The 51-day long 8th Theatre Olympics, the biggest international theatre festival held in India for the first time, staged more than 400 plays and hosted 78 allied events including 34 Living Legend series, 29 Master Classes, 7 Interfaces, 6 national and international seminars and 2 workshops across 17 cities. Besides, about 600 ambience performances and 250 youth forum shows took place during the nationwide event.